BP started as some sort of INF fanfiction IIRC. Of course the Sol war theme is similar, but that's it. There have been other campaigns (dunno how many), but MT is dead and BWO on hold/hybernating, so there aren't that many campaigns with that theme. There are a lot of dialogue pile-ups in the later missions, stuff happening out of order. Feels like it needed a few more days of playtesting. No, I only altered the text in existing messages. Whatever's wrong with their trigger conditions and timing was already there. Every time I run through the late depot mission (m12? ), for instance, I get this swamp of messages about a zillion things happening at once, and some of it seems to be out of order. What do I lose if I don't use the optional VP for radar icons? I've played two missions so far (great campaign BTW so far) and I'm not crazy about the fighter triangles being noticeable larger than usual. Use 3D radar, the scaling is set up for it. All the icons are much higher resolution than Galemp's pack so without scaling they'll look a lot larger. Without 3D radar you'll just get huge icons though. Played this twice already awesome 1st episode! I swore that mission got fixed. Looks like it didn't get fixed ENOUGH. I don't like how 'spam Corinthos win mission' becomes viable later on. BTW2 About text spam - as someone mentione sometimes there is a lot of text during full combat where I have to pause th game with F4 to read all dialogues. Maybe you should consider to make some voice acting from comunity? Huge congrats to the Inferno team on the release. About to give it a whirl now. Sorry I'm a bit late to the party! 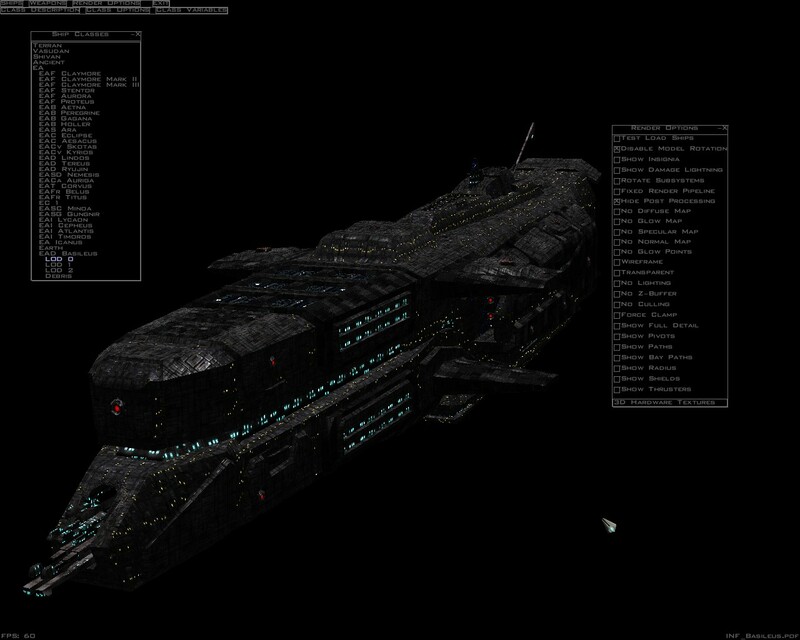 Well that and the Basileus is the only ship capable of out-ranging the GVD Apothess with its missiles. Any screenshot for Basileus and other later Act ships that are not in Act1 FRED? There're a couple of the untextured HTL Yama on the ModDB site, don't think there are any of the Basileus. I just noticed in FRED that Shivans have crazy amount of fighters - they have 19 fighter types! I guess they don't know the word "obsolecence" since they still throw Scorpions and Shaitans at you. You can ctrl-shift-S in the Tech Room to reveal all the entries. Do note that there might be spoilers. Said ship isn't used in R1 in any mission, it has no "In Tech Database"-flag, and it's not being SEXP-added to techroom as far as I can see this, so it shouldn't be a problem (but something like that can happen when you change between mods with different ship classes while using the same pilot file). I've now got through mission four and am still really liking it. Would the court martial/punishment for those departing freighters really be all that harsh? It actually made sense why they would want to split up. Yes, together they may have provided a better fighter screen, but they would have been easier targets for the Lindos as one of them said. Depends on how harsh the GTVA is and what does that fall under. Disobeying orders might get you dishonorably discharged, cowardice might get you imprisoned, or either might get you executed. They'd probably be cashiered out of the military. e: Even if their orders were going to get them killed, you've got to obey orders (for better or worse). Having those cruisers on field could've saved transports. So forgive me if I'm asking a dumb question. I dont know anything about this inferno stuff. This war depicted here sounds like the one from blue planet. Just wanna ask how is this one different? Inferno actually came out several years before Blue Planet originally, and features the Earth side as the aggressors and is less morally grey and story-focused, instead focusing on gameplay. Alrighty, so it's like blue planet but we are the GTVA and the earth ppl are the bad guys. Got it. I will miss the story focus from BP but I'll definitely give inferno a look!